The Fairchild PT-19 was a monoplane primary trainer aircraft that served with the USAAC, RAF and RCAF during World War II. It was a contemporary of the Kaydet biplane trainer. 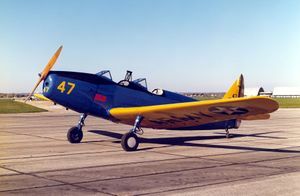 The PT-19 series was developed from the Fairchild M-62 when the USAAC first ordered the aircraft in 1940 as part of its expansion program. The original production batch of 275 were powered by the inline 175 hp Ranger L-440-1 engine and designated the PT-19. In 1941 mass production began and 3,181 of the PT-19A model, powered by the 200 hp L-440-3, were made by Fairchild. An additional 477 were built by Aeronca and 44 by the St Louis Aircraft Corporation. The PT-19B, of which 917 were built, was equipped for instrument flight training by attaching a collapsible hood to the front cockpit. When a shortage of engines threatened production, the PT-23 model was introduced which was identical except for the 220 hp Continental R-670 radial powerplant. A total of 869 PT-23s were built as well as 256 of the PT-23A, which was the instrument flight-equipped version. 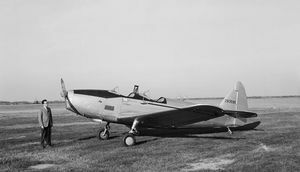 The PT-23 was manufactured in the US by Fairchild, Aeronca, St Louis Aircraft Corporation and Howard Aircraft Corporation and in Canada by Fleet Aircraft Corporation. Argentina, Brazil, Canada, Chile, Colombia, Ecuador, Mexico, Norway, Paraguay, South Africa, United Kingdom, United States (US Army Air Corps, US Army Air Force), Uruguay. This page was last edited on 6 March 2007, at 07:58.